Nest operators and nest algebras present a natural framework for studying causality constraints in multirate control systems . In this article, we first give a tutorial on this framework and then look at robust stabilization of analog plants via multirate controllers and provide an explicit solution to the problem. 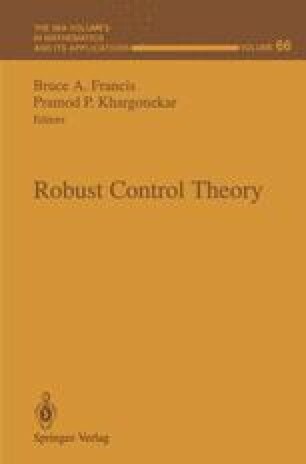 The authors would like to thank the organizers of the IMA Workshop on Robust Control Theory, Professors Bruce A. Francis and Pramod P. Khargonekar, and IMA for inviting them to participate in the workshop. Dept. of Elect. Si Comp. Engg., University of Calgary, Calgary, Alberta, CANADA T2N 1N4. Phone: 403-220-8357. Email. chent@enel.ucalgary.ca. The work of this author was supported by the Natural Sciences and Engineering Research Council of Canada. Previously with Inst. for Math.& Its Appl., University of Minnesota, Minneapolis, MN USA 55455. Now with Dept. of Elect. & Electronic Engg., Hong Kong University of Science & Technology, Kowloon, Hong Kong. Phone: 852-358-7067. Email: eegiu@uxmail.ust.hk.